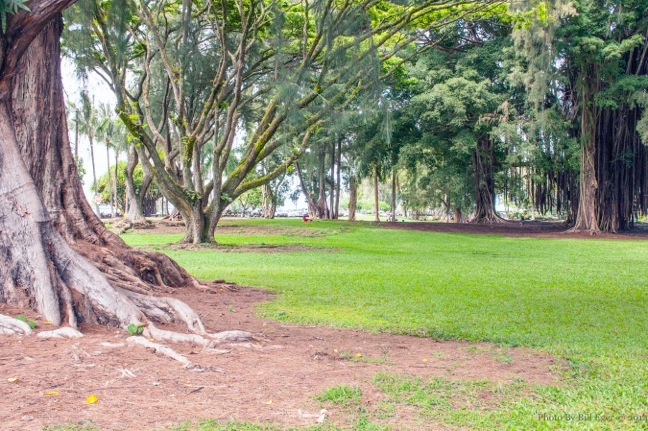 During the months of May, June, July, August, September and December in 2014 and January and March in 2015, nearly 130 volunteers put more than 520 hours into projects at Lili`uokalani Gardens with the agreement and cooperation of park maintenance staff. Many thanks are due to the members of Friends of Lili`uokalani Gardens for their hands-on approach. The Sierra Club Moku Loa Chapter, East Hawaii Master Gardeners Association, Fukushima Kenjinkai, Moku `Aina, Urasenke Hilo, and the UH-Hilo exchange students contributed greatly to this effort. Donations of material, supplies and tools were received from Ace Hardware, Jas. Glover, and individual board members. This includes everything from water, ice, and coffee for volunteers to gloves and trash bags to adding tools to the maintenance shed to soil and plants and fertilizers, and 16 tons of two different sizes of gravel (6 of #3, ¾” minus and 10 of #9). Paths have been improved. The Shoroan tea house garden is looking better. The seaweed in the pond has been reduced. Lines on the parking lot were refreshed with paint. Weeds in garden beds and on the roofs of shelters have been removed. Small trees have been pruned. Efforts were designed not only for general improvement but also to support the Fukushima Kenjinkai annual tanabata festival, the Queen Lili`uokalani Festival, and the Urasenke Society’s special events in July and September 2014, and January 2015. Park maintenance supervision has shifted from Mike Brown to Jason Mattos and a new wish list of tasks has been set forth. Spring volunteer work days have been set for Saturday, April 18, and Friday, May 15. Time is 8 a.m. to noon each day. Meet at the picnic table in the old sumo ring near the small parking lot and Shoroan tea house to sign in and choose assignments. To see any photo in this blog full size, click on the image. Any image not otherwise credited is by K.T. Cannon-Eger. You are encouraged to comment on articles in this blog. Please don’t waste your time trying to spam this blog. All comments are reviewed prior to posting and anything not related to the subjects discussed here will be summarily dumped with nary a second look nor regret. 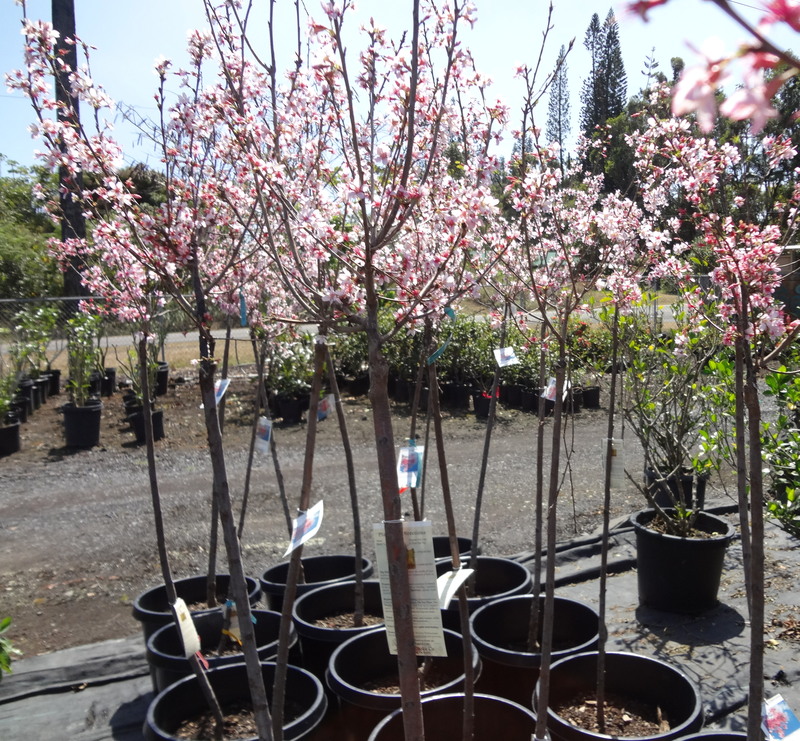 Two varieties of ornamental cherry trees are available for planting on the Big Island: Pink Cloud and Okame. Both are low-chill varieties, meaning there is a possibility they will succeed at elevations lower than Volcano or Kamuela. This Pink Cloud ornamental cherry tree, a low-chill variety hybridized at the Huntington in Pasadena more than 40 years ago, bloomed lightly in its second year in Hilo. 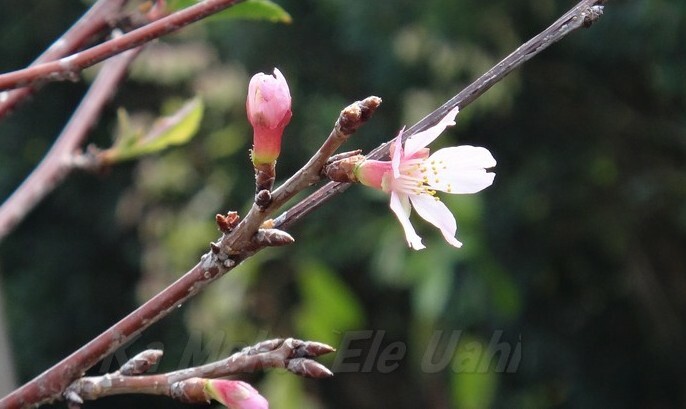 Okame ornamental cherry trees burst into bloom in Panaewa just outside Hilo at Mountain Meadows Nursery. The two varieties were chosen for their pale pink blossoming habit in addition to the low-chill variety. These trees have been successful in Pasadena, Los Angeles and San Diego. For further information on availability on Hawaii Island, contact K.T. Cannon-Eger or Mountain Meadows Nursery in Panaewa. If you wish availability in the mainland United States, please contact L. E. Cooke Nursery (wholesale nursery orders only) or your local garden shop. Local sales of Okame and Pink Cloud benefit the Friends of Lili`uokalani Gardens, a 501(c)(3) non-profit organization working toward the centennial of Hilo’s Lili`uokalani Gardens in 2017. Here is a link to an article on cherry tree history in Washington, DC, posted by the North American Japanese Garden Association.